What is the difference between a 6 mil, 10 mil., 12 mil. or a 20 mil. vapor barrier? This number refers to the thickness of the plastic. To be more precise, 6 mil means 6 millimeters or 0.006 inches thick. The thickness of the product adds to the life expectancy of the vapor barrier. 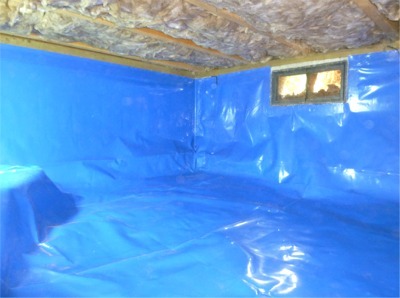 The standard vapor barrier has always been black 6 mil In Washington State. This is the minimum to meet current building codes. Truth is this is a relatively thin product that tears easily and probably won’t last over time. It can be purchased at most hardware stores for about $70.00 per 1000 square feet. There are, however, 10 mil and 12 mil products on the market today that have excellent vapor retardant capabilities and are tear resistant. Our technicians have samples of these so you can see for yourself the differences. We believe that if you are paying for a premium crawl space restoration it make sense to use a better quality product that truly will stand the test of time not to mention it looks absolutely fantastic. Before you hire a crawl space contractor ask them what product they use and ask to see samples of their different products so you can decide for yourself.